Mosquito Protect is an electronic pest repellant. 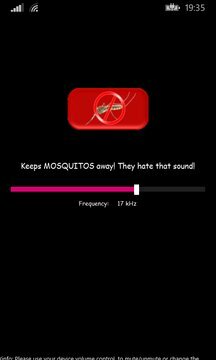 Mosquito Protect supports ultrahigh ultrasonic frequencies of 1 to 25 kHz. Anti Mosquito Protect Repel is effective against insects and many other pests. With Mosquito Protect Repel you will receive efficient and secure software that works. This makes Mosquito Protect so valuable. 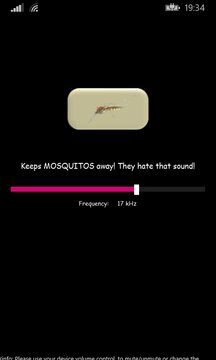 With a single app, Mosquito Protect, you can protect yourself against a large number of annoying pests, fully natural, with ultrasound, without using chemicals. This success is achieved through the individually adjustable ultrasound frequencies of Anti Mosquito Protect Repel. Simply switch on Mosquito Protect and the protection is ready - in the kitchen, the dining room, the bedroom, children's room and throughout the whole house. With the ultrasonic frequencies, you can finally protect yourself successfully against mosquitoes. With Mosquito Protect. After Mosquito Protect is switched on, Mosquito Protect emits a barely perceptible ultrahigh tone. Mosquitoes hate it and you are protected. Mosquito Protect works without chemicals, is non-toxic, odorless, and safe for children. Anti Mosquito Protect is ready to protect you, at any time, wherever you are. Anti Mosquito Protect, ultrasound protection against insects and mosquitoes at a higher level.